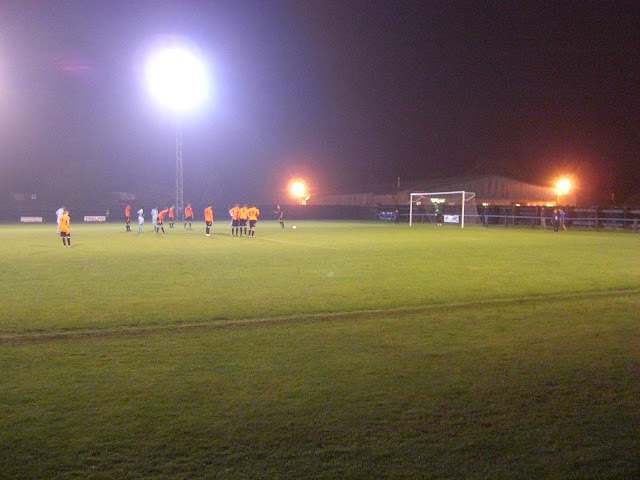 My seventy-fifth stadium of 2011 was on Monday 7th November 2011 at the GER Sports Ground in March, Cambridgeshire. 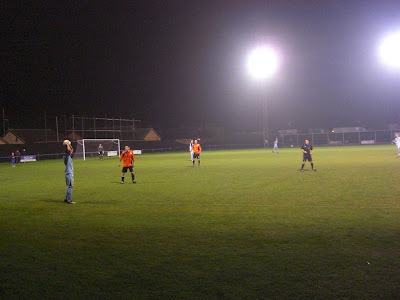 The match was March Town United vs. Cambridge United in a friendly game. The GER Sports Ground is three-quarters of a mile from March railway station in a residential area near the town centre. The ground has been home to March Town United since 1946 when they took over the venue from original occupants March GER United who had played there from 1923 until World War II when the club was disbanded. The main stand in the ground is a wooden structure just to the left of the half-way line along the east side of the venue. This contains wooden benching along most of the rows and could seat a few hundred fans. Inside this stand is the players dressing rooms. Directly opposite this on the west side of the field there is a covered standing area extending from near the south goal to just past the half-way line. The dugouts sit directly in front of this stand. 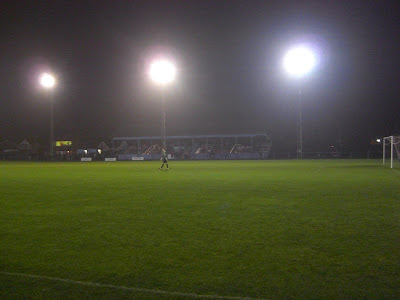 One unusual aspect of the ground is that the floodlights on both sides of the venue are just a few feet from the pitch meaning the two stands sit behind these, some distance from the field of play. This combined with the twelve supporting stanchions in the main stand mean the view of the action is not brilliant. The remainder of the ground is uncovered standing with a metal barrier meandering its way round the pitch and the stands. There is a small food outlet next to the main stand on the east side of the ground and just outside the gates of the ground itself is the GER social club. The game was a friendly marking the 125th anniversity of March Town United with the Eastern Counties League Division One side taking on Conference National side Cambridge United who brought a mixture of first and reserve team players. The away side began with intent and after going close several times in the opening minutes it looked like a high score was on the cards. However, March tightened up in defence and it was not until the 38th minute when Cambridge took the lead from the penalty spot after a push in the box. As the second half started, Cambridge came out of the traps quickly again and had the ball in the net only for it to be ruled out for offside. With 20 minutes to go a mistimed slide tackle in the penalty area led to another spot kick for the visitors which they duly dispatched. From this point on Cambridge laid siege to the March goal and added a third in the 76th minute with a smart finish at the back post after a ball across goal. The home side had their goalkeeper to thank for keeping the score down but with two minutes to go he was powerless to stop Cambridge adding a 4th goal to round off a comfortable 4-0 win for the visitors.